Today, all seems bright for the Eurostar operation. The commissioning of the Channel Tunnel Rail Link, the last section of which was brought into use on 14th November 2007, has reduced the fastest London to Paris journey time from 3 hours (1994) to 2 hours 16 minutes. Similarly, the quickest London to Brussels journey time has dropped from 3 hours 15 minutes (1994) to 2 hours 40 minutes (December 1997, on opening of the Belgian Western High Speed Line), and then to 2 hours 1 minute (2007). Additionally, we have seen the running of direct trains from London to new destinations in Southern France, and we now face the exciting prospect of through services to Amsterdam using brand new stock. However, back in the late 1990s, the mood was of a decidedly different ilk and a couple of major schemes which aimed to connect London and Britain's provincial cities with France, Belgium, Netherlands, and even Germany, became costly casualties of the "European Passenger Services" (EPS) project. EPS was set up in November 1990 as a wholly-owned subsidiary of the British Rail Board to procure passenger services through the Chunnel. The wheels were set in motion for daytime passenger services between London, Paris, and Brussels on 18th December 1989, when a contract was signed for the construction of thirty Trans Manche Super Trains. Destined to be the longest passenger trains in service on British metals, these would extend for a length of 394-metres, comprising eighteen carriages sandwiched in-between two power cars. This batch was quickly followed by the ordering of a further train formation, again twenty-vehicles long, and in December 1991 authorisation was granted for the building of another seven trains. Of the latter, these comprised a reduced number of passenger vehicles, fourteen in-between power cars, and were intended to provide Birmingham, Manchester, and Edinburgh with direct services to Paris and Brussels. The main drawback of the daytime services from the provincial cities to the continent, particularly when compared with competing air travel, was journey time. For instance, Edinburgh to Paris was estimated to take over 8½ hours which, at least from a business traveller's perspective, was too long to be on a train. Therefore, these services would more suit a leisure traveller who was perhaps less sensitive to journey duration and more concerned with price. Nevertheless, although this was realised at the time, it was thought that the popularity of the services would grow in the long term. Furthermore, the business market could still be tapped into from the outset, mainly in the form of continental "sleeper" services. To manage the proposed sleeper trains, "European Night Services Ltd" (ENS) was established in 1992. EPS was the majority shareholder of ENS, having a stake of over 60%, whilst the remaining interest in the company was held by SNCF, Deutsch-Bahn (DB), and Nederlandse Spoorwegen (Netherlands Railways). The advantage of overnight sleeper trains was that potential clientele, whether they be business or leisure travellers, were less sensitive to time. Naturally, this was linked to the fact that for the majority of their journey they would be in their slumber. Thus, the "Nightstar" project was born: this aimed to provide both London and the provincial cities with direct overnight trains to a series of locations on the continent, some of which were not on the proposed schedules of any of the daytime services. Glasgow and Edinburgh trains would reach London via West Coast and East Coast Main Lines respectively, although it had not been confirmed at the time that both Scottish cities would be recipients of overnight trains. Traction would be electric throughout to the tunnel portal for Scottish services, as would indeed be the case for London trains. Plymouth and Swansea resided on non-electrified lines, which meant that from these cities to London, the sleepers required diesel power. Early signs of trouble arose through difficulty getting a contract signed for the stock's construction. Metropolitan-Cammell of Washwood Heath, Birmingham, which by this time had been absorbed into the GEC Alsthom empire, was eventually awarded the work. The contract was signed in June 1992 and clearly, no half measures were taken, for the order encompassed 139 vehicles with a combined price tag of £120,000,000. Funding would be provided by a large bank, from which ENS would then lease the stock. This was essentially the arrangement which was later adopted for the franchises of the privatised British Rail, whereby operators leased, rather than owned, stock. The optimism did not stop there either: it was expected that the first "Nightstar" services would start running in 1995, so by the late 1990s, there would be fully-fledged day and night trains between all major parts of Britain and North West Europe. In appearance, the design of coach which prevailed was not too dissimilar to BR Mk 4 stock, at least based on the side profile. Of the 139 vehicles ordered, 72 were dedicated sleepers, 47 were fully seated, whilst the remaining 20 were designated "service" cars. It was to be in these service cars that the Train Manager (or, if you like, "Train Captain") would be accommodated. Catering facilities would also be incorporated and a reception and lounge for passengers would be present. The sleeping cars were each to accommodate twenty berths, split amongst ten cabins, the sleeping arrangement being of the "bunk bed" form. All cabins would have their own toilet, whilst six out of the ten would incorporate a shower. Communication with staff in the service car would be afforded from each cabin by a direct telephone link. Finally, the seating cars were designed to accommodate fifty reclining seats in a 2 + 1 arrangement and three toilet cubicles - two at one end of the coach and one at the opposite end - would be provided. "Nighstar" services departing Waterloo International would comprise sixteen vehicles, formed of two subsets of eight semi-permanently coupled carriages. Each subset would contain five sleeping vehicles, two seating vehicles, and a service car. Those overnight trains through the Chunnel from the provincial cities would be shorter, at fourteen carriages long. These would be formed of two seven-vehicle subsets, each comprising three sleeping vehicles, an equal number of seating carriages, and a service car. Because of axle load restrictions, "Nightstar" trains would be unable to use the LGV Nord line to Paris, instead being restricted to "classic" SNCF routes. Kensington Olympia, formerly home to a British Rail "Motorail" terminal and once considered as a potential location for London's international railway terminal, was to be the nucleus of the "Nightstar" operation for the provincial services. Two roles were to be performed here: locomotive exchange and train dividing/joining. Those services emanating from Swansea and Plymouth would swap diesel power for electric traction. "Nightstar" services from those locations beyond London would start their journeys to the capital as trains comprising single subsets of seven vehicle length; then, at Kensington Olympia, they would be marshalled into longer fourteen carriage trains by amalgamating those subsets bound for the same destination. For instance, the subset of the Plymouth to Brussels service would be coupled to the Edinburgh to Brussels subset, and thus the pair would continue onto the Chunnel portal and their ultimate destinations as a fourteen coach service. Indeed, on the return leg, the subsets would be split at Kensington Olympia and continue separately onto their UK destinations. For the London to Dortmund/Frankfurt sleeper, such a split would occur on mainland Europe: at Cologne, the eight-vehicle subsets would separate, each continuing onto their respective city. The sleepers from Waterloo International and southwards from Kensington Olympia would be hauled by a brand new fleet of electric locomotives. Forty-six of these electrics, which became Class 92, were ordered from Brush Traction, Loughborough, at a cost of £138,000,000, although of these, only seven would be dedicated to the "Nightstar" operation. The remaining locomotives would be split between British Rail business sector Railfreight Distribution (thirty) and France's SNCF (nine). More information can be found in the Class 92 section, but in brief, these locomotives were to be capable of running off 25kV overhead wires and 750V DC third rail, and conformed to signalling systems of both British Rail and the Chunnel. As far as France was concerned, the Class 92 would work no further than Calais on SNCF metals, for the type was not equipped with the KVB signalling system which was required for operation on the French network. The locomotives were to haul freights as far as Frethun Yard, which ran parallel with the southeastern side of Coquelles Shuttle Terminal, SNCF traction taking over thereafter. However, in preparation for the "Nightstar" operation, AWS signalling - as used in Britain - was installed between Frethun and the SNCF Calais Ville terminus station. It was intended to reverse all sleepers at Calais Ville, at which point SNCF Class "BB 36000" electric locomotives would take over. Safety legislation required "Nightstar" stock to be top-and-tailed by locomotives through the Chunnel. Therefore, at Dollands Moor on the British side of the operation and Calais in France, a second Class 92 would be attached to the rear of the train. All members of the Class 92 fleet were allocated to Crewe Electric Depot for maintenance. For the diesel portions of the "Nightstar" services - i.e. those running on the Great Western Main Line - twelve Class 37 locomotives were selected from the TrainLoad freight sector to become a dedicated pool. These were taken to Doncaster Works for a complete overhaul, being regeared for higher speeds and made compatible with passenger stock requiring Electric Train Supply (ETS). However, ETS would not be sourced directly from the locomotives, but instead be provided by a pool of generator vans dedicated to the "Nightstar" service. Five BR Mk 3 ex-sleeper cars were selected for conversion to this role and more information on these vehicles and the 37/6 sub class can be found in the Class 37/6: EPS section of the website. The daytime London to Paris/Brussels "Eurostar" services commenced on 14th November 1994. The "Nightstar" project took a positive step forward on 31st January of the following year when the first of the overhauled Class 37/6 locomotives, No. 37601, was formally handed over to EPS at Doncaster Works. A day later, No. 92020 became the first Class 92 to become part of the EPS fleet in a ceremony at Waterloo International. As of 31st March 1994, the date of the then latest audited accounts of EPS, the company had a capital value in terms of fixed assets of £928,000,000. On 11th November of the previous year, the Government had announced its plans to privatise EPS by transferring it to the consortium which won the bidding process to build and operate the Channel Tunnel Rail Link (CTRL), forming part of the state's financial contribution to this project. On 29th February 1996, it was formally announced that a consortium under the name of "London & Continental Railways" (L&CR) was the preferred bidder to build and operate the CTRL. The taking over of EPS (including this company's share of ENS) saw the transfer of a series of infrastructure assets including Waterloo International, St Pancras station, and North Pole and Manchester International Depots, from Government to L&CR ownership. In April 1997, the first "Nightstar" vehicles were available for testing and trial runs behind Class 92s were carried out on the northern portions of the ECML and WCML, notable workings being between Carlisle Yard and Carnforth, and Newcastle and Edinburgh. The stock was also run down south on the Tonbridge to Ashford line behind EPS Class 37/6 locomotives. Indeed, this was some way behind the original 1995 start date for "Nightstar" services and the bad news did not stop there: in May 1997, the project was put on hold as a result of rising costs. Construction of the CTRL began in October 1998 and the financial situation at L&CR worsened. The company made known that the existing daytime "Eurostar" services were carrying much lower passenger numbers than originally forecast, which plunged both "Regional Eurostar" and "Nightstar" projects into doubt. In February 1999, the Government stepped in to financially assist, taking a large share of L&CR at this time. The fateful day was 9th July 1999: "Nightstar" and "Regional Eurostar" schemes were formally cancelled. Cancellation of the aforementioned passenger services made about £300,000,000 of brand new rolling stock redundant. The Regional Eurostar sets went into store at North Pole Depot, whilst completed "Nightstar" stock was delivered to MOD Kineton, Warwickshire, for secure storage. Of the 139 "Nightstar" vehicles, 64 carriages had been finished; the rest were largely completed, although lacked interiors, project abandonment coming prior to these being fitted. The fleet had been outshopped in a two-tone scheme of turquoise and dark green: the seated carriages wore turquoise on the upper &frac23; of their body sides, with the remaining lower third dark green. The sleeping cars and service vehicles wore the reverse scheme. That saloon sandwiched in-between the seated carriages and service car wore a "split" livery, combining both versions. It had not been a bed of roses for the Class 92 fleet either across all three bodies which operated the type. Railtrack, the organisation which had taken control of former British Rail infrastructure on 1st April 1994 and was subsequently privatised on 20th May 1996, had started implementing draconian signalling interference criteria. This became problematic for the Class 92 because given its high electrical power rating, it became nigh on impossible for the fleet to adhere to any of the new regulations laid down. This barred the locomotives from a number of key routes, including that line between Redhill and Tonbridge which had been electrified in 1994 specifically for Class 92 operation. It also prevented the class members reaching their home depot at Crewe, which meant that they had to be dragged there "dead" by a diesel from as far away as Wembley. In June 2000, three of the obsolete "Nightstar" carriages were shipped to Canada where that country's railway operator, "VIA Rail", was looking to test them with a view to purchase. The carriages were hauled on test workings between Ottawa and Montreal during November of that year and on 15th of the following month, it was formally announced that all 139 vehicles would be bought for 125,000,000 Canadian Dollars. They were destined for use on an overnight train between Toronto and Halifax. All vehicles arrived at Newport Docks, South Wales in October 2001 for shipment to Canada. On the other side of the "Pond", those vehicles which lacked interiors were fitted out and all carriages adapted to cope with the harsh Canadian winters. 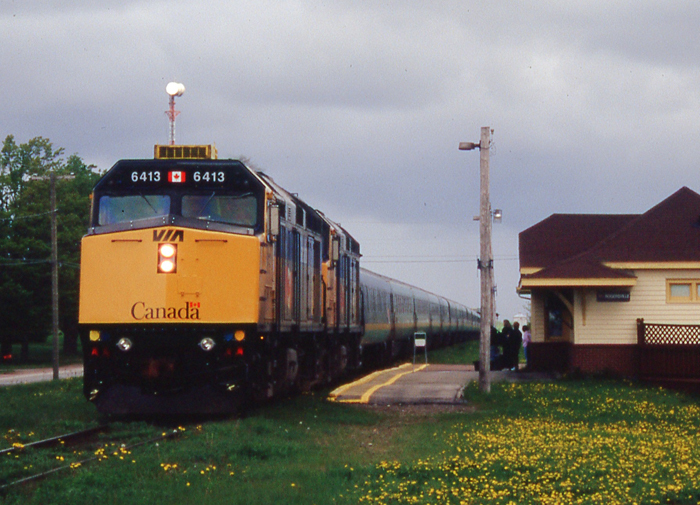 The original "Nightstar" livery was retained, albeit with slight modifications involving application of a yellow stripe on the body sides, where the two livery colours met, in addition to "VIA Rail" branding. The first full completed rake operated on 23rd June 2002 under the "Renaissance" brand.